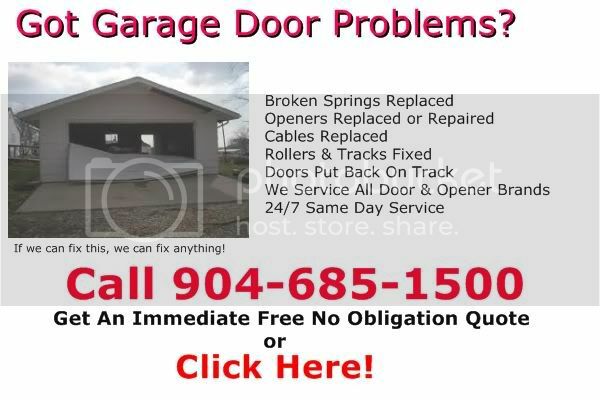 Garage door springs are designed to fail. They are usually rated for 10,000 cycles. When your garage door springs have reached that number of cycles, they are destined to fail within a matter of days, weeks or months. Not years. That’s why it is recommended that when one spring breaks, it’s best to replace the other spring at the same time. But the choice is yours. If you want us to only replace one spring, you’re the boss. Just call us at 904-685-1500. Hopefully you gained some basic knowledge and understanding of garage door springs and can identify your lifting system. Remember garage door springs can be dangerous and you always need to wear safety glasses gloves and use the proper tools when working on your garage door. If you do not feel comfortable performing the repair or are of unsure of the procedures always call your local garage door technician at 904-685-1500.